Offering more than 4,000 square feet of inspiration, the 2017 O’More Designer Show House at Voce in Brentwood was built on land that belonged to country music icon Eddy Arnold on south Granny White Pike. The ShowHouse showcased the designs of four decades of O’More alums, all leaders in their field. Designed to be exceptionally welcoming, from the exterior paint colors to the interior finishes, the home was harmonized with progressive design and technology. Chelsea Skye Mills of Sanctuary South; Amy Morris of Amy Morris Interiors; Corey Morris of C Morris Studios; Gretchen Pennell of J. Haynes Interiors; Kathy Sandler of Sandler Design Group; Jonathan Savage of Savage Design Group; Elaina Siren or Red Leaf Interiors; Randi Stovesand of Tanley Blake Interiors, and Jamaica Zralek of Red Leaf Interiors. Amy Morris Interiors designed the family room with soft, ivory panels at the large floor-to-ceiling windows to allow natural light to fill the space. “The quintessential family room is a gathering place—truly the ‘heart of the home,'” says Morris. Botanical art was used to bring the outside in and served as a reflection of the natural landscape that surrounds the home. A mix of tailored furniture, velvet, wool, and natural materials provide a contrast in texture that creates an elegant yet comfortable space. Serving as inspiration for the dining room by Jonathan Savage of Savage Interior Design is the Maison Jansen designed dining table. The table’s brass gilt tabletop is supported by a mirrored scrolling leg and connected to a shapely stretcher. The table adds a sense of history to an up-to-date yet modern space. 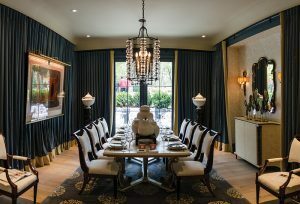 Complimenting the table are the accents on a delicate pair of Paul Ferrante chandeliers. Warm creams mixed with soft golds, muted blues, and fine textures create an intimate space. It echoes the White House’s Blue Room designed by Maison Jansen in 1962 at the direction of Jacqueline Kennedy. 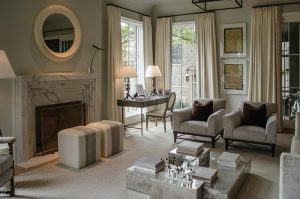 Robert Brown of Robert Brown Interior Design transitioned to interior design after spending more than 20 years in the fashion industry. The outdoor room is designed as a living space giving its visitors the ability to enjoy the outdoors while being protected from the elements. Playing against the dark surfaces is modern outdoor furniture that contrasts against the beautiful, traditional architecture. Bold graphics fabrics show an artful variance to the rhythm of the architectural envelope. The stark black, white, and taupe palette is repeated in the contemporary art. Four selected Fashion students from O’More’s Fashion Design program were chosen to style his and hers closets Adjoining the master bedroom, the two bathrooms, an enchanting hall, and upstairs laundry room join the master bath in creating an enchanting and elegant space serving the master suite. 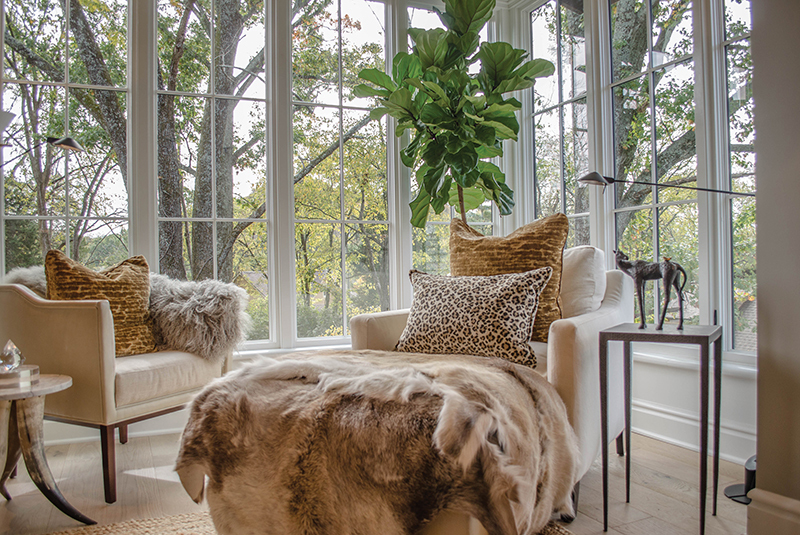 Lila Pryor Frank of Lila Pryor Frank Interiors designed the master bedroom as a restful retreat, drawing its palette’s inspiration from the views of the surrounding landscape. Brown and green accents complement the tones of the natural world while overtones of ivories and grays are utilized to create an ethereal softness. 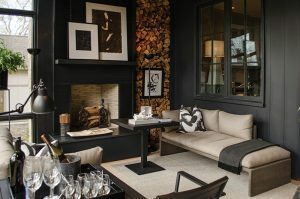 Natural textures combine with lush velvets, linens, and gold tones to strike a balance that references the home’s exterior while creating an elevated atmosphere found in a safe haven. Inspired by the retreat-like surroundings of the Voce development, Jamaica Zralek and Elaine Siren of Red Leaf Interiors created a stunning outdoor oasis that invites visitors to curl up with a favorite book and at the same time provides a space that can serve as the backdrop for a great cocktail party. Nature provides a background to the rich textures, soothing color palette, and elegant furnishings that combine to create a courtyard that shelters and invites. As is typical of a collaborative Show House, each designer was assigned one of the home’s rooms to decorate in the home. Land Innovations served as the property developer. “Você, one of LI’s current projects under construction, is one of the most innovative single-family home communities in Middle Tennessee and exemplifies our philosophy of working with the existing natural beauty of a property,” says LI partner Rob Pease. Você—which means “voice” in Italian—sits on 61 acres that were the home place of country music icon Eddy Arnold until 2008. In keeping with Arnold’s wishes, his grandson, Shannon Pollard, and the Land Innovations team have partnered to preserve the natural beauty and historic character of the property. Land Innovations’ plan will preserve in excess of 60% of the trees at Você. The architect for the project was Carson Looney a founding principal of Looney Ricks Kiss. 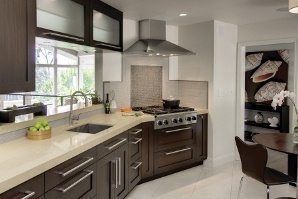 Looney has received more than 415 regional, and national residential design awards. Brady Fry or Fry Classic Construction was the builder for the O’More Designer ShowHouse. Honorary chairs for the Designer ShowHouse were Amy Morris of Amy Morris Interiors and Robert Brown of Robert Brown Interiors, while Kimberly Kelly of K7 Interior Design + Lifestyle served as lead designer for the project and Kimberly Sundt served as the project consultant. The Designer ShowHouse benefited the O’More College of Design which was founded in 1970 by Eloise O’More. O’More College of Design cultivates a passion for design through a distinctive undergraduate education in a student-centered environment and its graduates are well-known for the design expertise. For more information call 615/ 948-2452 or visit www.omoreshowhouse.com.